Field Artillery men in action. Two great feats of the US Army Artillery in World War II were the February 1943 emergency forced march of the 9th Infantry Division Artillery (Div Arty) into Tunisia, North Africa, and the Division’s resulting victory in the battle against a German panzer Division of Field Marshall Irwin Rommel at Thala Pass. Furthermore, the 9th Div Arty fought without the Division’s three Infantry regiments present. The 9th Artillery had been too far away to help stop the crushing German breakthrough of the Allied lines near the village of Kasserine and the mountain pass there. But it arrived in time to beat Rommel’s forces near Thala Pass. Rommel’s panzers had decimated the slim line of mostly American defenders in the Kasserine area—mainly the US 1st Armored, 3d Armored and 34th Infantry Divisions. The experienced Germans kept on, quickly forging ahead toward another important pass at Thala, 30 miles northwest of Kasserine. The raw, untested troops of the then soundly beaten US II Corps retreated westward in an undisciplined and unorganized disarray. Officers, even colonels, made little or no effort to recover. Vehicles and ambulances were filled with the wounded and Infantrymen without their equipment. All were heading west. When questioned by the 9th Div Arty column arriving from the west, these officers and soldiers replied that they had been overrun at Kasserine by superior numbers of German tanks and Infantry and that they had been ordered to retreat to try to reconstitute somewhere in the rear. By the time the Allied Force Headquarters (AFHQ-Eisenhower) knew of Rommel’s ferocious attack, there were no reserves nearby to throw into the defense at Kasserine. There was no uncommitted Infantry or armor to call upon. However, most of the 9th Div Arty was some 800 mountainous miles to the west at Tlemcen, Algeria. AFHQ began sending whatever combat units they could to stop Rommel from penetrating further. If he got to the important supply junction at Tebessa, just across the border in Algeria, he could seriously threaten the Allies in the north and delay plans to conquer North Africa and Sicily by weeks or even months. So, should the 9th Div Arty have been sent to fight Rommel’s panzer forces without their 9th Division Infantrymen? Without question, the emergency demanded it. By the time the 9th Div Arty could get into the area, Rommel’s General Baron Friedrich von Broich’s 10th Panzer Division was driving hard up the road from Kasserine to Thala. Only a few British Infantry platoons were in position to slow the panzer tanks and Infantry. Mid-February had witnessed a major disaster for the US Army at Kasserine, and another worse disaster appeared to be looming at the western passes beyond Kasserine. Colonel Justin W. Stoll’s 84th Field Artillery Battalion. Did this affect the morale of the green 9th Artillery men who knew little of what lay ahead as they moved toward their first battle? The results of the battle of Thala answer a definite, “No.” Among the iron men of the march were the vehicle drivers, especially those who drove the big GMC and Diamond- T trucks that pulled the 105-mm and 155-mm howitzers. They hardly got any sleep during the entire march. At the few short rest periods, their sergeants had to briskly jolt them awake in order to get them started again. Certain drivers later received Bronze Star medals for their determination along with maintenance mechanics who repaired breakdowns and road repair problems day and night. By the morning of 21st of February, the column reached its crossroads destination town of Tebessa. It had nearby airfields and a huge supply depot for American and British ground and air corps personnel. At that point, the town was frantic with a hodgepodge of rumors flying, uncoordinated evacuation activities and roads crowded with ambulances, military equipment and vehicles. When the column stopped at Tebessa, General Irwin found new orders awaiting him. He was to turn north immediately into Tunisia and head for the mountain pass behind Thala. There, he was to take command of a mixed group of American and British Artillerymen who were desperately trying to stop, or at least slow, the fast-approaching panzers and Infantry of the 10th Panzer Division. Elements of Brigadier Charles Dunphie’s greatly outnumbered 26th British Brigade were doing what they could to slow the Germans. Some even were running along ridgelines firing their rifles to make the enemy think the Thala defenses were stronger than they actually were. By dusk of 21st of February, Irwin’s column arrived behind Thala Pass, exhausted, cold and hungry. 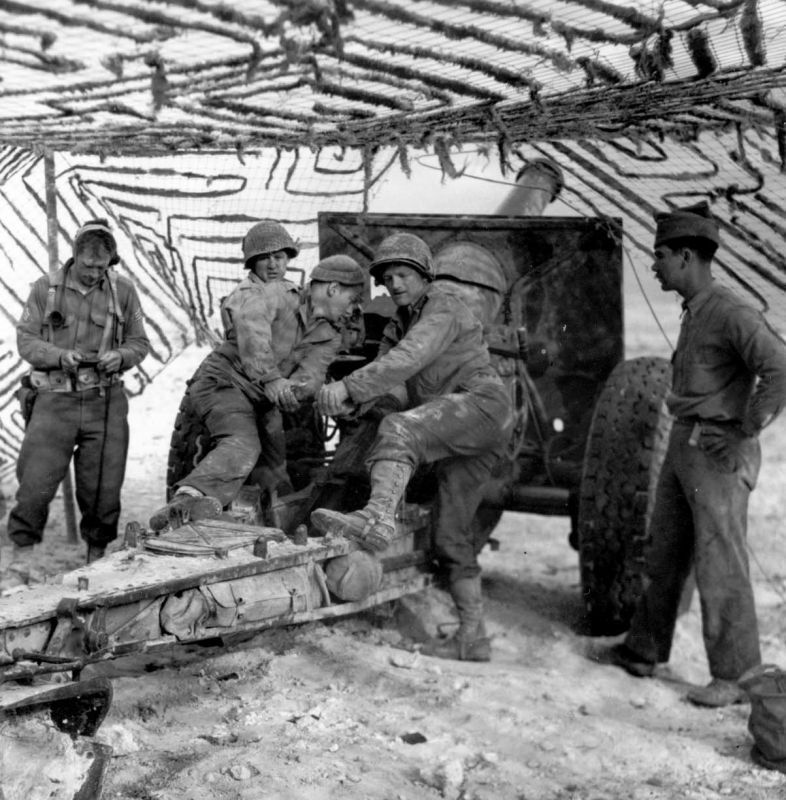 That night was spent preparing for action – digging in the guns, unloading and stacking the ammo, making night survey data, tying plots together, aligning gun barrels by use of aiming circles and stakes, and setting up radio and wire communications – doing all the things necessary for artillery to perform effectively. Communications that night and early the next day were mostly out as many radios were damaged by the bumpy jolts of the march. Hand-laid wires kept getting knocked out by enemy shelling. Gun-laying instruments were not properly declinated for this location. However, Brigadier H.J. Parham, the British First Army Artillery officer, was on the scene, supplying surveys, maps and suggested gun positions, all of which sped up accurate firing operations. The news of the arrival of the 9th Div Arty at Thala was a great boost to the morale of the Allied defenders there. They had just been consolidated under the command of Brigadier General Cameron Nicholson, Assistant Commander of the British 6th Armored Division. His small task force of Infantry Armor could not be expected to stop the German panzer Division just over the next ridge line. But a small group of his “Nickforce” tanks heroically slowed the Division down in time for Irwin’s artillery to start blasting away at it at dawn on that cloudy morning of 22nd of February. Irwin had positioned himself up on the front ridge of the British forward observation post (OP) overlooking the advancing Germans. Irwin made this forward Allied OP his forward command post for all the artillery in the area. A unit of British artillery already there was preparing to direct fire on the Germans on the downward slope of the ridge. Irwin knew that Captain William F. McGonagal’s C Battery, 84th Artillery, had practiced direct fire by bore sighting. (Bore sighting is not just looking through or along the tube, it consists of making the optical axis of the gunner’s panoramic telescope parallel to the lineof- sight through the center of the tube using various instruments and methods.) So Irwin called the four 105-mm guns of C Battery up to the ridge to go into action. Two of its guns were hit and put out of action that day, but not before the battery had destroyed two enemy Mark IV tanks plus lighter vehicles and accompanying Infantry. In addition to being shelled, the defenders were subjected to bombing by German Stuka dive-bombers throughout the day, although cloudy skies had limited both German air operations and those of the US XII Fighter Command. 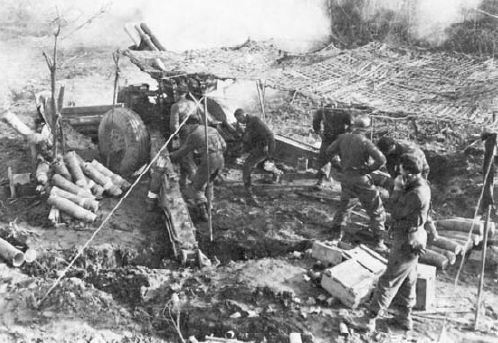 The artillery kept up a steady and relentless “drumfire” on the Germans so much so that by later that afternoon, the howitzer ammunition was 15 minutes away from being exhausted. By the end of the next day, the 9th Div Arty suffered 45 casualties, including eight killed. It had fired 1,904 rounds. When the 9th Artillery started firing on the morning of the 22nd of February, German General von Broich quickly was informed that the larger blasts were obviously 155-mm howitzers. He also knew from Arab spies that troop movements had come into the pass area the previous night. Knowing that 155-mms were an integral part of an Infantry Division’s artillery, he became mistakenly convinced that an entire new Infantry Division had arrived. His men were tired and under strength from their Kasserine fighting, and thought they could not withstand a fresh enemy Division on the scene. He and his 10th Panzer Division stopped. With Rommel’s approval, von Broich ordered his troops to withdraw back east from where they came. Rommel, a sick man at that time, also was disillusioned by his arguments with General von Armin in the northern sector. Von Armin was not cooperating with the new command arrangements where he came under Rommel’s command. Von Armin pulled back his troops that were threatening Tebessa. As Allied reinforcements arrived daily in the Tebessa and Thala area, it was downhill from then on for the Germans in North Africa until their surrender on 13 May 1943. The 9th Div Arty was awarded a distinguished unit citation for conspicuous gallantry and heroism in battle on 21, 22 and 23 February 1943. The Thala Battle, which one could say was won by the artillery, was America’s first land victory over the Germans in World War II. It led to their surrender and withdrawal from North Africa and, thus, to a much safer opening of the Mediterranean and on to Sicily. An early 9th Division Commander was Major General Jacob Devers, later commanding general of the 6th Army Group in wartime Germany. The 9th’s Commander in North Africa was Major General Manton Eddy, later 3d Army’s XII Corps Commander in Germany and then commander of the reactivated US 7th Army in post-war Germany. General Irwin and Lieutenant Colonel Westmoreland both had excellent training at the US Military Academy at West Point. Many others of the 9th Artillery, such as Colonel Alexander Patch of the 47th Infantry Regiment, later Commanding General of the 7th Army in wartime Germany, knew the value of leadership and training in making the 9th one of the war’s premium Divisions. This proved to be of paramount importance. Fortunately at Thala, the 9th Artillery had had more than its share of practical training. It was a regular army Division and was manned by the early 1941 draftees who were the best America had to offer. Training at night was obvious for fighters,but not so much for truck drivers. The 34th FA had many such night exercises in the states, including for its truck drivers. The night training helped in other ways. The Artillery needs the skills to recon and set up new firing positions quickly, especially at night. The Artillery can’t just stop and fire effectively like a rifleman or tank can. In the states, C Battery, 84th Field Artillery conducted bore sighting training, even though it was considered unlikely the battalion would need this skill in combat. The instruments and methods were designed for 1,000 yards, but at Thala, the Battalion needed its bore siting skills for short-range direct fire. Also while in the states, all ranks, officers and enlisted, were trained to be able to perform the jobs of their immediate supervisors in the 34th Field Artillery. Officers were required to know what went on at least two levels down. The 34th had practiced widening or closing the spread of a battery’s four guns from the normal 200 yards to 800 yards, or even positioning guns next to each other, as conditions required. This practice is desirable in deserts, plains and mountains and useful at Thala. It was only after Thala that the importance of massed firing was realized and understood and that a centralized (fire direction center) FDC was the way to control it. Forward Command Post—Irwin’s locating at a good forward OP and making it his forward command post was a pivotal strategy at Thala. His tactics were in contrast to those of the Commander of the US II Corps, Major General Lloyd Fredendall, who located his command post 70 miles back in an underground mining bunker. It sounds basic today, but the concept of having a command post so far forward was new then. The Allies cooperated at Thala Pass, consolidating their efforts to stop the German panzers. Today, our armed forces operate similarly under many types of command arrangements all around the world.2 Much has been written about the North African campaigns of the US Army, from the November 1942 Operation Torch landings in French Morocco and Algeria on through to the May 1943 conclusion in Tunisia where the Germans were thrust out of North Africa by the Allied forces of America, Great Britain and the Free French. The Thala Battle, immediately after our disaster at Kasserine, was neither a long nor large one, but it was the turning point in North Africa, avenging Kasserine. At Thala, without the 9th Division Artillery, the outnumbered and outgunned defenders certainly would have been overrun. The Germans retreated from Thala Pass and, just under three months later, from North Africa. About the author: Robert C. Baldridge is a World War II veteran with service in the 34th Field Artillery, 9th Infantry Division in England, France and Germany. He received a battlefield promotion to Second Lieutenant and was awarded the Bronze Star Medal for his actions as a Forward Observer with the 9th Infantry. Mr. Baldridge graduated from Yalein 1948 and retired from the textile industry. He is the author of Victory Road, his World War II memoirs. Mr. Baldridge passed away on February 19th, 2005. This article was originally published in the May – August 2002 Issue of Field Artillery Journal. All credits to Field Artillery Journal and Robert C. Baldridge.